If you had looked at my blog entry here, i would have shown how to go about drilling from BI EE to HFR. Along the same lines, lets look at another common requirement which is to drill from BI EE to Web Analysis. Again as i have said here before, the fundamental idea is to get the URL parameters for Web Analysis and understand how Web Analysis accepts its parameters. 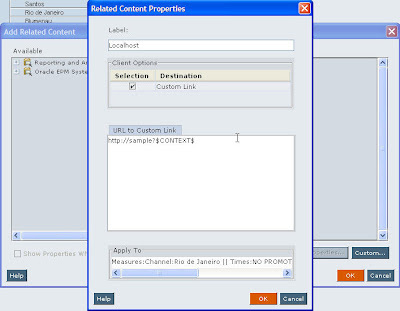 In order to understand this, lets create a simple report using Web Analysis studio as shown below. Lets analyze all the 3 links one by one. The first one is the Embedded link. 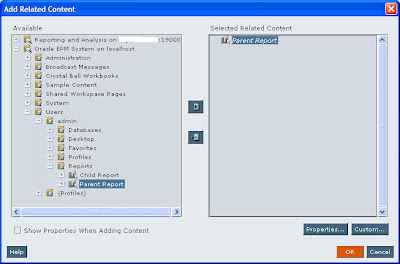 1. module – This is a workspace specific parameter which specifies that the report comes as a related content. 3. repository_format_id – Since workspace can embed multiple objects of different mime types, this specifies the output type of the report. 7. CONTEXT – This passes the actual POV of the cell that we have clicked. This is the most important parameter as this would let us know how the parameters are passed to web analysis. 8. mime_type – This determines the application type. Typically it is recommended to use the Embedded link as the output type is generally driven by the URL parameter itself. The second link is the Java Link. This helps in drilling within the studio itself. This is not generally used a lot unless a person requires the drill to happen within the studio itself. The parameters are exactly the same as the one in embedded link. 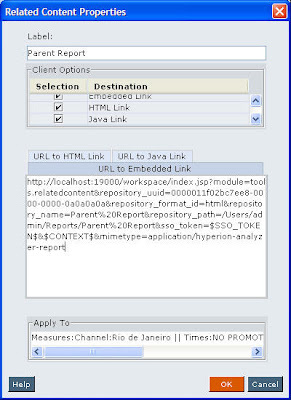 But not every parameter in the Embedded link is supported in the Java Link. In all the 3 links above, the most important of all is the $CONTEXT$ parameter. This is what passes down the individual Point of View (POV) values to the target. But to pass this from BI EE, we need to know how this $CONTEXT$ parameter is structured. So, instead of using a report as a related content, lets include a custom link as shown below.